M & I received a joint birthday gift form my parents this past weekend. It is a GPS and we both love it! Even though I already know the way home we decided to use it and see it in action. The funniest thing is they decided to get it for us when at the end of a visit I was exhausted (it must have been after 9:00) but I had to stay awake because M didn’t know the way home. 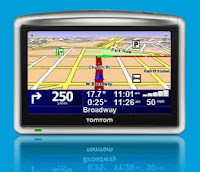 That very car ride home I demanded M start looking at GPS units. Great minds think alike. We had a lovely visit as usual. D made lobster for most of us and a grilled pork chop for M. Yum. I had a swim in the pool and got some much needed outside time. In the evening we all played some Wii. Just lovely.